Did you send a wrong message to a different person on WhatsApp? or just want to recall or unsent a Message that you already sent in WhatsApp? 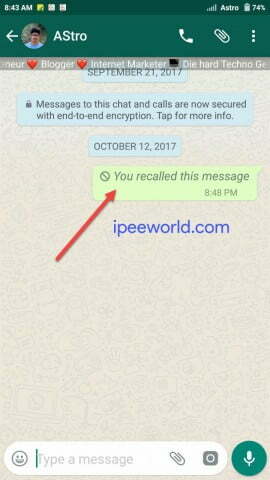 Whatever it is, today in this article you will find How you can recall a sent WhatsApp message easily without any hassle. It’s been a long time since users are waiting for WhatsApp to roll this feature. 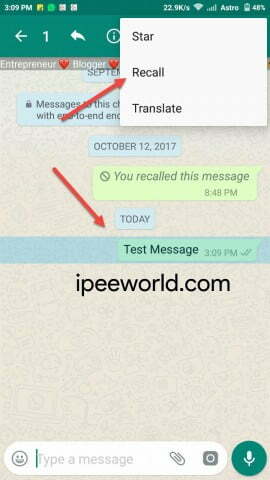 But wait… This feature is not live yet, But today in this tutorial you will find How you can use this Message Recall feature in WhatsApp before it officially launches on the Official version of WhatsApp. As mentioned earlier, there are a lot of situations where we wanted to revoke a sent WhatsApp message. Maybe, we might send a message to the wrong person. So at these situations. If the receiver has not read the message, then we can recall the sent message and delete the message from receiver’s phone as well. 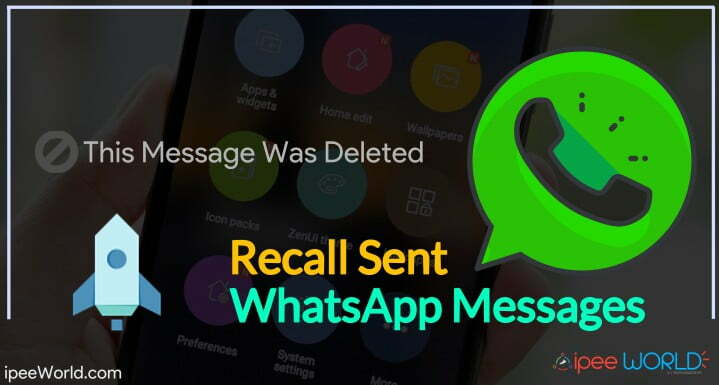 As said earlier, Recall Messages feature is not live on WhatsApp yet. WhatsApp is about to roll out the new feature by next new update. So, the official version of WhatsApp that is available on the Google Play Store won’t help us in doing the job done. Refer below to Recall Sent WhatsApp messages easily. You wanted to send a little bit awkward message to your friend. And you sent it. After sending the message you realize that you sent that message to your Mom or Dad, what will you do if they have not yet read the message. Well, that’s exactly why you are here on this Page. You have two options to get the Recall feature in WhatsApp. The first one is by installing the GBWhatsApp and the second one is by installing the Latest Beta Version of WhatsApp which is not available for everyone. You can download the Beta Version of WhatsApp from the Play Store only if you have already enrolled in the Beta Program of the specific app. Here we will be talking about the GBWhatsApp method. So, without further ado, let’s get started. For this trick to work, you will need a modified version of WhatsApp called GBWhatsApp. You can download the App from the link given below. I have written everything about GBWhatsApp including its Pros and Cons, so read it before you download it. So, let’s get started. Once you downloaded the app, Install and Open it up. Import existing backup and create an account. Now send a message to anyone you would like to. Once the message gets delivered, follow below-given steps. Tap and Hold on the message that you wanted to recall. Click on the three dots icon and tap on Recall button. Now a small popup box will ask whether you want to recall the message or not. Just hit the Recall button and you are all good to go. Let’s see how to use the Beta version of WhatsApp to recall sent WhatsApp messages in no time. You have now successfully recalled or unsent a WhatsApp message. Whenever you accidentally sent a message to a wrong person, you can always use this method to call them back and revoke the message. And tap on I’m In button. Wait for a few hours and a notification will appear telling that there is a new Beta Version available. So, Hope you guys found this tutorial useful. 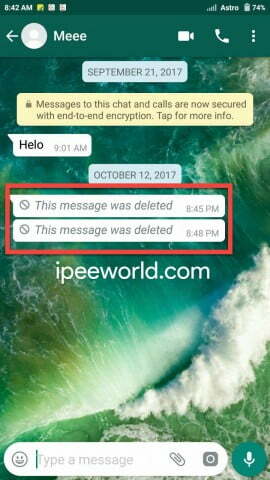 Next time when you wanted to delete or recall a sent WhatsApp message in less than a second, Simply follow the instructions mentioned in this article. This is a really great trick that helps us a lot. GBWhatsApp is a cool WhatsApp mod that let us do this kindaa stuff. Be sure to share your opinion about this article below in the comment section. Also be sure to share this article with your friends and let them know about this trick, too. Stay tuned for more amazing contents and see you guys soon.